Volvik Championship Trophy produced by Motawi Tileworks. Photo courtesy of Motawi Tileworks. The LPGA Volvik Championship has revealed the unique trophy produced for the tournament by Ann Arbor’s Motawi Tileworks. 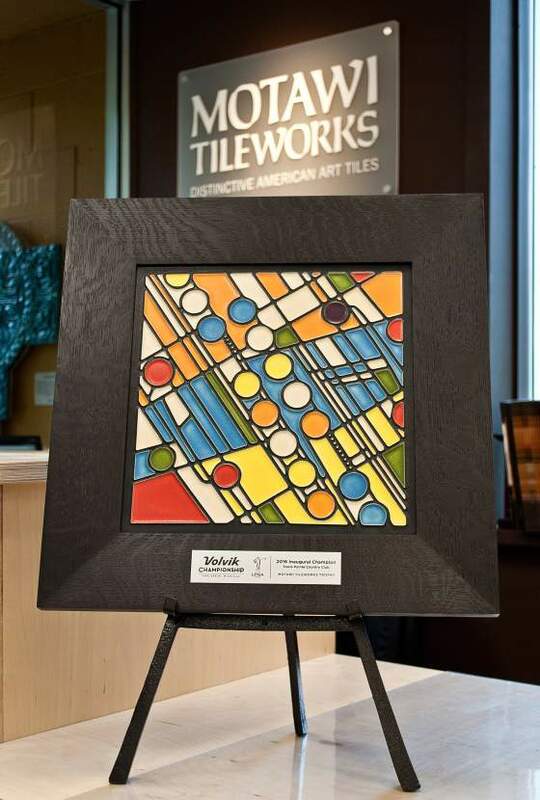 Inspired by Volvik’s colored golf balls, the twelve inch square Motawi Tilework Trophy is hand-made and one-of-a-kind. The 12×12” tile is the largest tile that can be pressed on Motawi’s 60-ton RAM press which required a special case that contained the over 100-pound mold made just for this one tile. The tile spent an extended period of time in the dryer before it was kiln-fired for its first firing – a process that lasted nearly a week! After the initial firing (called bisque firing), the trophy was carefully and meticulously hand glazed by an artisan using a bulb syringe. The result: the ultra-contemporary design which plays with the brightly colored Volvik dots in a way that only Motawi can do. Motawi Tileworks was founded by Nawal Motawi in 1992. Motawi had studied ceramics at the University of Michigan and worked at Detroit’s legendary Pewabic Pottery before striking out on her own. Motawi Tileworks produces art tiles known for their “Arts and Crafts Movement” designs. Motawi Tileworks makes three kinds of tile: polychrome, with colors separated by small clay ridges; relief, with raised surfaces and hand dipped in a single-color glaze and; field tiles, which are flat and dipped in a single colored glaze. Motawi’s work can be found in more than 320 galleries, showrooms, and museum shops, including the National Gallery of Art and The Chicago Architecture Foundation. They’ve got a raven tile that I lust after and keep having to talk myself out of buying every time I see it at an Ann Arbor art fair. During the tournament, Motawi tiles are available for purchase in the Motawi tent, on the Motawi website (www.motawi.com) and at the Motawi studio gallery located in west Ann Arbor at 170 Enterprise Drive. In addition to its regular weekly free public tour, during the tournament, Motawi will offer an additional free public tour. Tours will be held at 11am both Thursday and Friday of tournament week at the studio gallery. The trophy will be presented to the Champion at the Inaugural Volvik LPGA Championship in Ann Arbor, Michigan May 26-29, 2016.